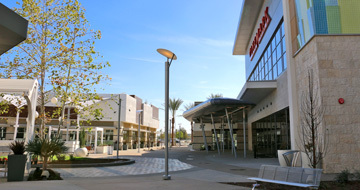 The Promenade at Downey is a new promenade-style shopping center development in Downey, California; it is a community gathering spot and shopping destination, in the historical center for aerospace and entertainment industries. The site was previously home to Downey Studios, one of the largest movie sound studios in the United States (developed by IRG), and NASA, which manufactured components for Saturn and Apollo spacecraft missions on the property. 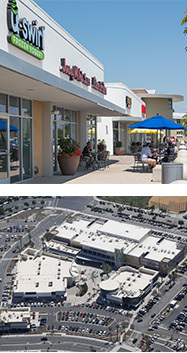 The 450,000 square foot, Promenade at Downey is now a mixed-use development and includes retail space, with a wide array of shops and restaurants, a state-of-the-art movie theater, a health club, and other tenants. Its pedestrian-oriented design incorporates outdoor seating, Wi-Fi, fireplaces, and playgrounds. Demolition of Downey Studios began in January 2012, and Phase I of construction has been completed, including infrastructure construction and initial site work. Phase II was completed in 2016 and included the remaining horizontal improvements, vertical improvements, tenant improvements, and final environmental remediation. Throughout their ownership of the property, IRG executed millions of dollars in extensive remediation including 14 years of bio remediation and injections to reduce high VOC levels in the groundwater; removal of more than 1 million square feet of asbestos; and removal of various other toxic substances from the site.